Three options are available when confronted with an erosion problem: take no action, relocate endangered structures, or take positive action to halt the erosion. The latter includes devices that either armor the shoreline, intercept or diminish wave energy offshore, or retain earth slopes against sliding. Any alternative requires evaluation of the shoreform, planned uses of the land, money and time available, and other effects of the decision. The no action alternative is used to help evaluate different options. When confronted with an erosion problem, the first, reaction is to act immediately. What is not realized at first is the expense of even low cost solutions. Therefore, it is advisable to estimate the losses involved in doing nothing, particularly if only undeveloped land or relatively inexpensive structures are threatened. Also, erosion may be caused by temporary factors (e.g., unusually high Great Lakes levels), and in such cases, it may be advisable to wait for the erosion rate to slow before acting. No action is generally unacceptable, and in most cases, steps must be taken. Before investing in shore protection, however, physical relocation of endangered structures should be considered. This could involve moving them either to a different area or farther from the water on the same lot. Moving a building involves considerable expense which could be wasted if it is not moved back far enough. Therefore, it is necessary to evaluate the erosion rate (feet/year) and the likelihood that this rate will continue at or below historical levels through the required life of the setback. 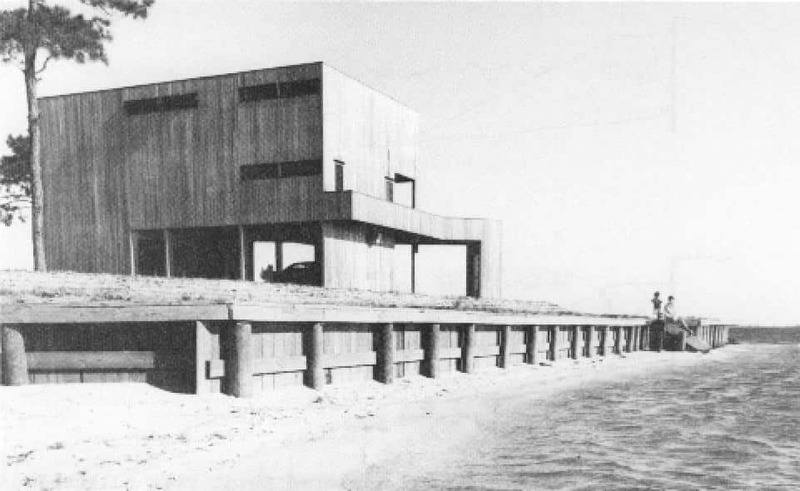 “Bulkheads” and “seawalls” are terms often used interchangeably in referring to shore protection structures. Bulkheads are retaining walls, however, whose primary purpose is to hold or prevent sliding of the soil. While they also provide protection from wave action, large waves are usually beyond their capacity. Seawalls, on the other hand, are massive structures used to protect backshore areas from heavy wave action. Their size generally places them beyond the range of low cost shore protection. They are also not generally needed in sheltered waters where large waves do not occur. 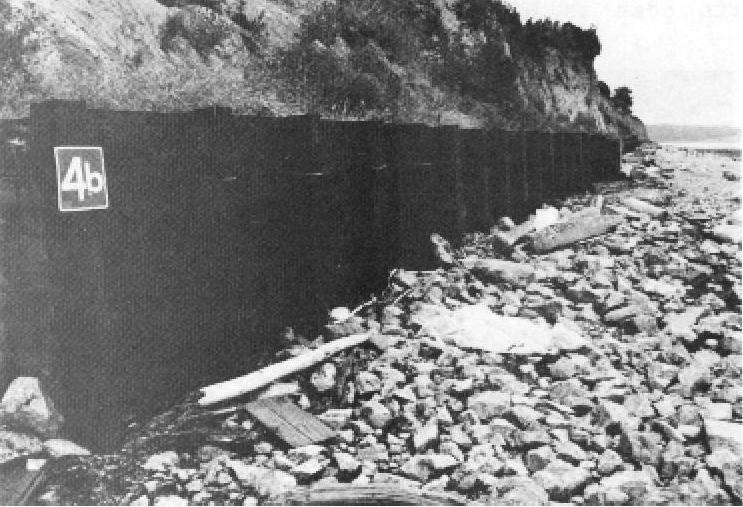 Bulkheads may be employed to protect eroding bluffs by retaining soil at the toe, thereby increasing stability, or by protecting the toe from erosion and undercutting. Bulkheads are also used for reclamation projects where a fill is needed at a position in advance of the existing shore. Finally, bulkheads are used for marina and other structures, where water depth is needed directly at the shore (Figure 7). Construction of a bulkhead does not insure stability of a bluff. 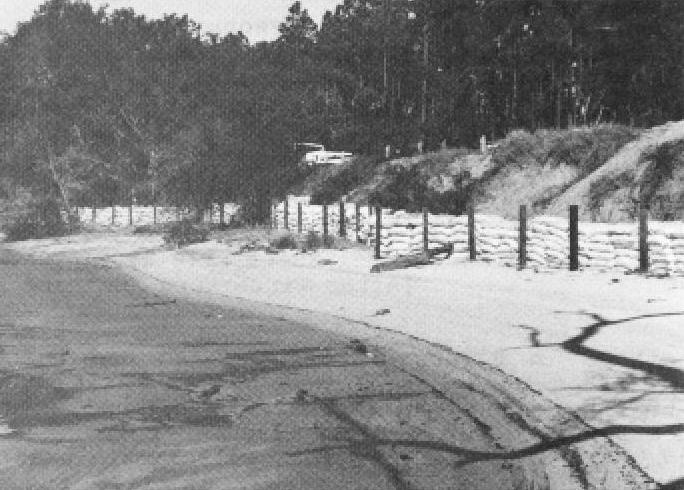 If a bulkhead is placed at the toe of a high bluff steepened by erosion to the point of incipient failure, the bluff above the bulkhead may slide, burying the structure or moving it toward the water. To increase the chances of success, the bulkhead should be placed somewhat away from the bluff toe, and if possible, the bluff should be graded to a flatter, more stable slope. 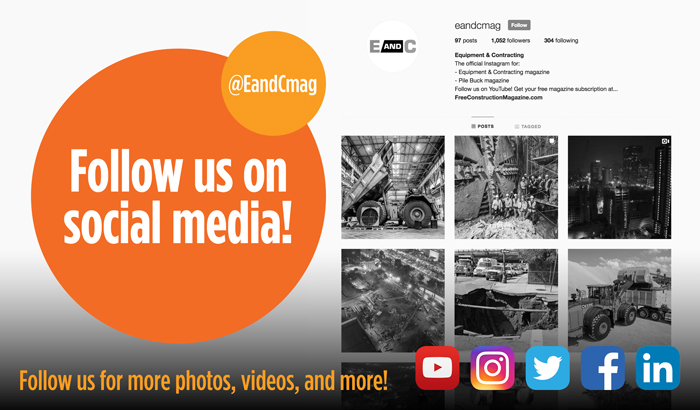 Bulkheads may be either thin structures penetrating deep into the ground (e.g., sheet piling) or massive structures resting on the surface (e.g., sand- or grout-filled bags). Sheet pile bulkheads require adequate ground penetration to retain soil. Stacked bag structures do not require heavy pile-driving equipment and are appropriate where subsurface conditions hinder pile penetration. However, they need firm foundation soils to adequately support their weight. Because they do not generally penetrate the soil, they often cannot prevent slides where failure occurs beneath the surface. This limits their effectiveness to sites where the backfill and structure are low. 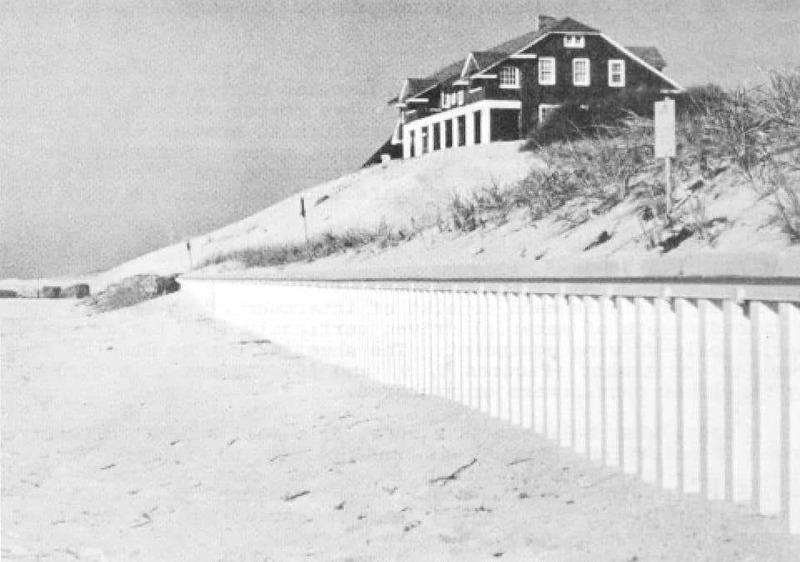 Bulkheads protect only the land immediately behind them and offer no protection to adjacent areas up and down the coast or to the fronting beach. 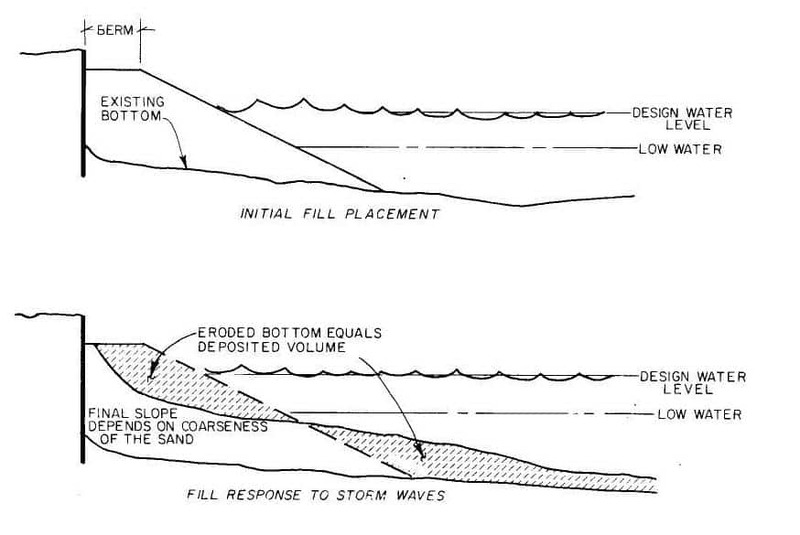 In fact, because bulkheads normally have vertical faces, wave reflections are maximized, wave heights and overtopping may increase, and scour in front of the structure is more likely. In addition, if downdrift beaches were previously nourished by the erosion of land now protected, they may erode even more quickly. 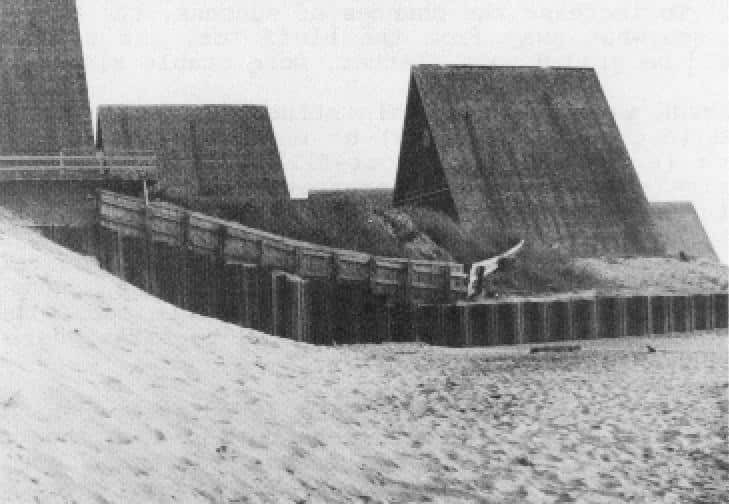 If a beach is to be retained adjacent to a bulkhead, additional structures such as groins or breakwaters may be required. Since scour can be a serious problem, toe protection is necessary for stability. Typical toe protection consists of quarrystone large enough to resist movement by wave forces, with an underlying layer of granular material or filter cloth to prevent the soil from being washed through voids in the scour apron. 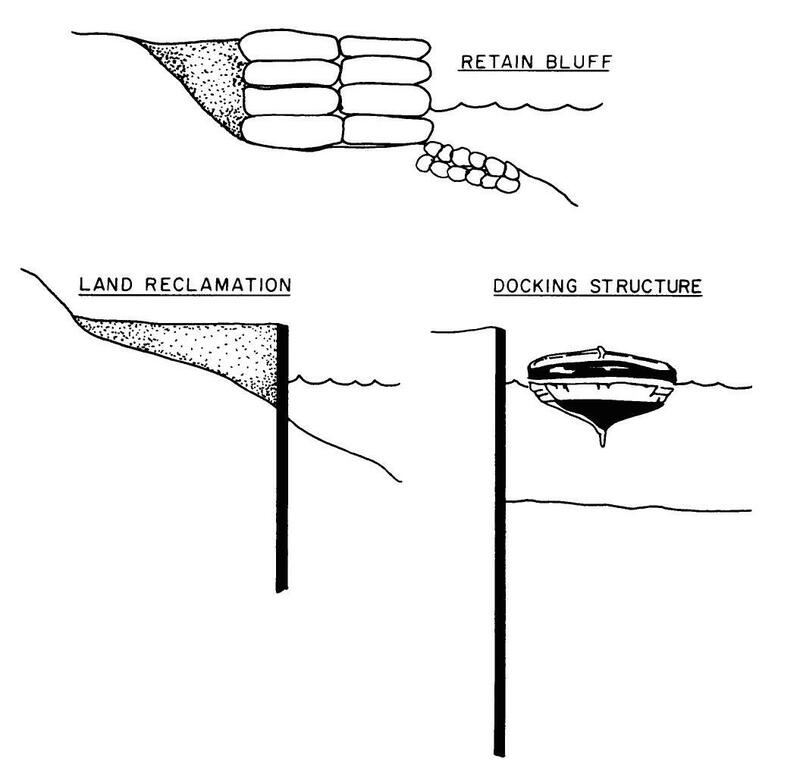 Flanking (erosion of the shore around the ends of the structure) can also be a problem. This can be prevented by tying each end into existing shore protection devices or the bank. 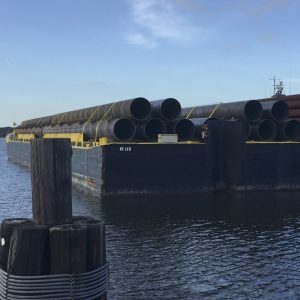 Sheet pile bulkheads consist of interconnecting or very tightly spaced sheets of material driven vertically into the ground with special pile-driving equipment. The sheeting can be made of steel, aluminum, or timber (Figures 8, 9, and 10). Sheet pile structures may be either cantilevers or anchored. A cantilever bulkhead is a sheet pile wall supported solely by ground penetration, making it susceptible to failure from toe scour. 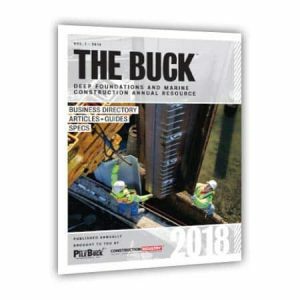 The sheet piling must be driven deep enough to resist overturning, which usually requires penetration to a depth two to three times the free standing height, including the anticipated scour depth (usually about one wave height). An anchored or braced bulkhead is similar to a cantilever structure, but gains additional support against seaward deflection from embedded anchors or tilted structural bracing on the seaward side. For this structure, the piles generally only need to be embedded to a depth one and one-half to two times the height of the wall above the anticipated scour depth. 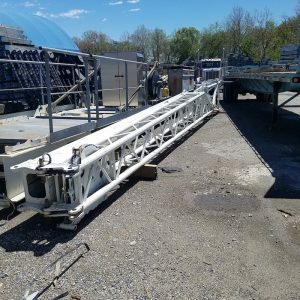 Anchors are usually a row of piles or line of heavy objects with a large surface area (deadmen) driven or buried a distance behind the bulkhead. Connections between pile anchors or deadmen and the wall should be wrought iron, galvanized, or other corrosion-protected steel. Plain carbon steel should not be used for long-term protection. Horizontal wales at or near the top of the wall laterally distribute the anchor loads. Anchor systems are not well suited to sites with buildings close to the shoreline because of the distance needed between the bulkhead and anchors. In that case, brace piles may be used in place of anchors. Figure 11 illustrates cross sections of cantilever and anchored sheet pile bulkheads. 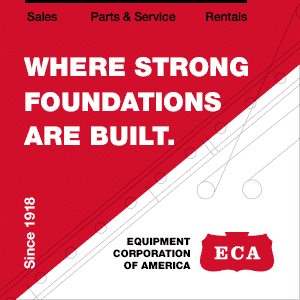 The type of soil at a site determines the type of sheet piling that can be used. Steel sheet piling can be driven into hard soil and some soft rock. Aluminum and timber sheet piling can be driven or jetted into softer soil. 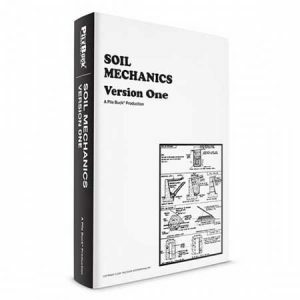 An analysis is required to determine the subsurface conditions at a site and should be performed prior to selection of materials. The advantages of sheet pile bulkheads are their long and relatively maintenance-free life and their uniform appearance. 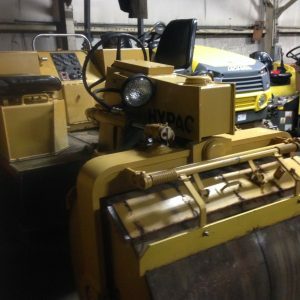 Their disadvantages include the special pile-driving equipment and trained operators required to install them. The equipment is noisy and requires a fairly wide access route with ample maneuvering room at the site. Treated Timber. Well designed and built timber structures have long been recognized as viable and economical for bulkhead construction. 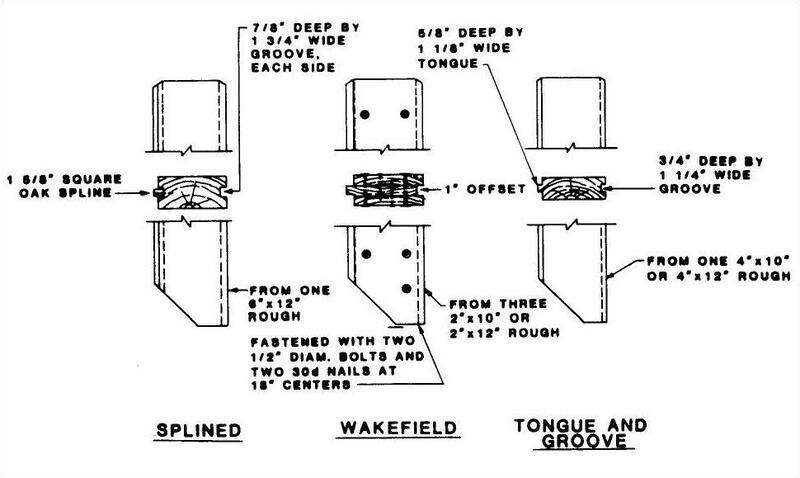 Figure 12 illustrates the common types of timber sheeting used. Only specially treated timber should be used for marine construction to prevent deterioration from marine borers. The joints between sheets should be kept as tight as possible and filter fabric should be used as an added precaution against loss of the soil through cracks. 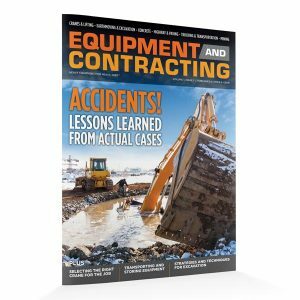 Only granular material should be used for backfill. Supplemental drain holes should be placed at regular intervals to further facilitate movement of water from behind the structure and these must always be backed with filter cloth or crushed stone filters. All hardware and fasteners should be corrosion resistant or protected metal. In addition, washers should be provided under all bolts and nuts to insure that these bear evenly on the timber members. Steel. 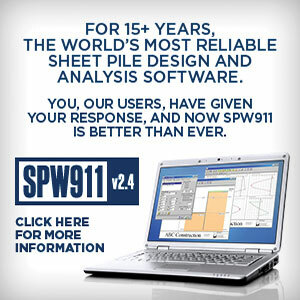 Steel sheet piling is probably the most widely used bulkhead material (Figure 13). 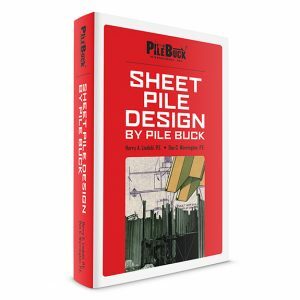 The interlocking feature of sheet pile sections provides a sand-tight fit, generally precluding the need for filters. The close fit may also be essentially watertight so regularly spaced weep holes are recommended. These, and lifting holes in the piling, should be backed with graded stone filters or filter fabric to prevent loss of backfill. Aluminum. 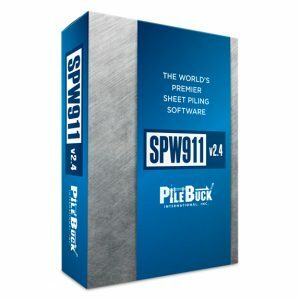 Aluminum sheet piling, which comes in sections similar to those in Figure 13, is designed and installed using conventional methods and equipment. 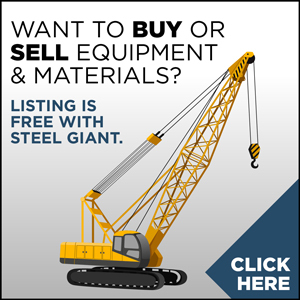 Its primary advantages over steel are lighter weight and superior corrosion resistance. Individual sheets can be carried and maneuvered by one man, and most drilling and cutting can be performed with simple hand tools. Its main disadvantage, compared to steel, is less ruggedness when driven, so it usually cannot penetrate logs, rocks, or other hard obstructions. Asbestos-cement. This material seems to suffer significant and rapid deterioration in marine environment and should not be used when long service is essential. Post Supported Bulkheads. A post supported bulkhead consists of regularly spaced posts, usually timber, driven into the ground with an attached facing material that forms a retaining wall. The posts support the bulkhead and resist earth pressures exerted against the structure. As with sheet piling, a post supported bulkhead can be either a cantilever or anchored. An advantage is that once posts are emplaced, the facing material can generally be installed and repaired by individuals without resorting to heavy equipment. The cost of these bulkheads depends on the spacing of posts and type of soil. Hogwire Fencing and Stacked Bags. Hogwire fencing attached to posts can be used to support sand bags stacked on the landward side of the fence (Figure 14). The structure can fail for a number of reasons, primarily the vulnerability of the sand bags to undercutting by toe scour, which causes them to tear as they slide against the hogwire fencing. The structure is relatively inexpensive, however, and can be used when properly designed. This would include the use of PVC-coated, small mesh wire, deeply embedded posts, placement of bottom bags and fencing in a trench to eliminate toe scour undercutting, use of ultraviolet light-resistant fabrics or sand-cement slurries for filling bags, adequate relief of drainage from behind the structure, and ample toe protection. Untreated Logs. Horizontal untreated logs can also be attached to the landward side of posts. This is particularly advantageous in areas such as the Pacific Northwest, where there is an abundance of logs. The same precautions about adequate toe protection and filtering also apply, since large gaps between logs make adequate filter design more difficult. 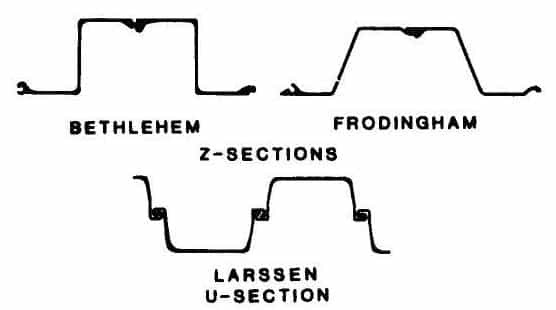 If a cloth is used, it should follow the log contours so that it is not excessively stressed by bridging the large gaps. Filter cloth is vulnerable to damage or vandalism, however, which would jeopardize the entire structure with the resulting loss of fill. For that reason, the use of logs is probably more risky than use of treated timber. Used Rubber Tires. Used tires can be strung over two rows of treated posts set in a staggered pattern, with the tires abutting each other and filled with gravel. The posts are tied back to logs buried in the backfill, with filter cloth placed behind the tires before backfilling. Under wave action, the gravel tends to wash out of the tires, and the backfill can then escape. Although used tires can generally be obtained free, the structure is probably comparable in cost to other post bulkheads because of the required close spacing of post holes. This kind of structure is generally not recommended.